I’ve been a fan of e.l.f. cosmetics for some time now; it’s affordable and top quality. 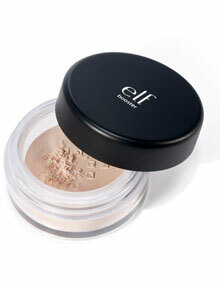 E.l.f makeup does not contain parabeds, preservatives, or chemical dyes. It’s 100% natural mineral. I love their mineral booster. It melts into your skin and evens up your skin tone while nourishing it with A, B, and E vitamins. Mineral Booster gently absorbs oil and minimizes the appearance of wrinkles, fine lines, and pores, and it’s only $5! Colors such as fuschia, blue, and melon are in this season. The key to color is to buy it sparingly and wear it with last year’s basics. Big skirts, daisy dukes, and gingham will make you look country cute in a big city. Wear out your slips and camisoles; skin is in! Platforms are in and the higher the better. Of course to look great in these trends we have to feel great in our skin by taking care of it inside and out. Tanya Zuckerbrot’s book “The F-Factor Diet” is ideal for losing that winter weight and toning up. She swears by fiber and protein, these two essential nutrients that should be added to every meal because they take the longest to digest. It is this perfect combination of foods that keeps your serum glucose levels consistent, leading to improved energy throughout the day. For the finish touch of a bikini ready body check out the new American Laser Centers’ procedure called VelaShape Treatment. Combined with a good diet and exercising you will be cellulite free at last! Thank you for the great shout-out. We are so happy that you were able to join us at our Beauty Boost event and we hope to see you again soon!